If people on social media are correct (and we all know that social media is the place for accurate and level-headed opinions), we could be heading towards the apocalypse sometime between today and tomorrow. In that case, having a playlist for the apocalypse on hand is a good idea. 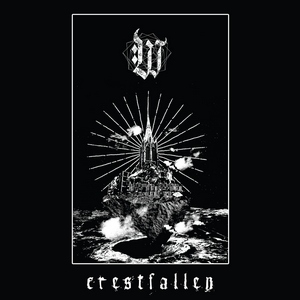 Weltesser’s Crestfallen has a few tracks to add to that playlist, especially if the playlist consists of nothing but grim, sludgy doom metal. Crestfallen is a feedback-laced, venom-dipped ride of misery. There is no end to the degradation, no punching through the smog stifling the clean air out of the proceedings. Only in the closing title track does anything besides that ensue, thanks to a dour clean guitar stripped of any beauty until the rumbling fuzz returns. This is a tiring album to get through that doesn’t get less so after repeated listens. While probably not recorded in this method, the whole album feels like it was produced in one small room, as they went at it with minimal retakes or digital editing. This kind of sinister energy can’t be replicated by a computer, but from the demented minds and angry hands of musicians pissed off at everything around them. Though that doesn’t lead to much in terms of variety, the blunt force of their music is undeniable. For some, that’ll be enough to elevate Crestfallen, and to be fair, the second half is much more vital than the digressive opening songs. The debut album from Weltesser doesn’t capsize any conventions or twist up an established formula, but it’s good for extra minutes to add to the apocalypse playlist that’s probably going to come in handy much sooner than expected.